1 vs.24….Because NO ONE DEMANDED IT! Yep, Marvel decides to take the easy money and whore out its two biggest team franchises against each other. Well, FF used to be big, but changing the name, as well as those lame arse white costumes pretty much screwed them. Well, now, we are going to have a melee between Wolverine’s favorite teams, with him stuck in the middle. As you may know from the short stories recently in Marvel books, cheating you out of pages of the story you wanted to read when you bought the book, the Phoenix force is back….and Hope Summers, supposed Mutant Messiah, is getting too big for her britches. Woohoo. Let’s go back to the Phoenix well! And what’s this I see? Scarlet Witch involved, too? Gee, Phoenix meets House of M….how….lame. Give me a break, people. Let’s see some solid stories where Cyclops ISN’T more of a self righteous deluded superiorist than Magneto! The Scarlet Witch story is pretty good. Wanda is slowing trying to come out of her seclusion and be a hero again. She takes on a group of Modoks when Spiderwoman and Ms. Marvel show up to assist. They convince her to go to Avengers Mansion and see the old team, make up and say hi. Well, they seem to have forgotten about a newly revived synthezoid who may have something to say about Wanda’s return. Vision is back and ready to lay some smack down! Well done, sir! The scenes between the two are poignant and deeply emotional, especially for someone like me who has been a big fan. The Hope Summers story makes me more suspicious of Hope and especially Cyclops. Cyclops seems to be nothing more than Magneto without control of metal and with an eye problem. Cyclops is a jerk. Hopefully it will turn out to be mental influence by White Queen. Hope Summers appears to be a spoiled ungrateful brat. This does nothing but make me dislike my mutant cousins. I will be firmly on Team Avengers, but I know what will happen. They will make Cap look like the bad guy again….ugh. This is an event that didn’t need to happen. 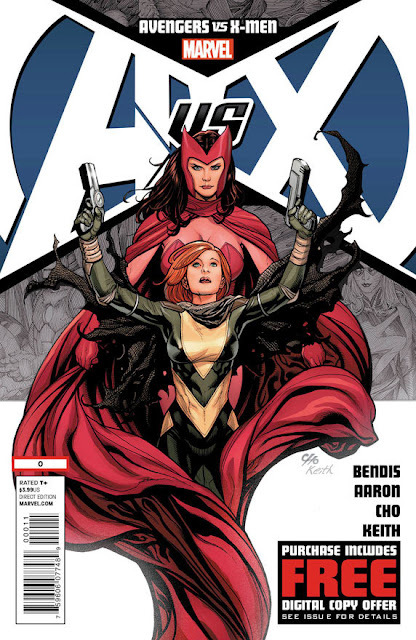 The intro book gives it away that somehow, the Phoenix Force will affect both the Scarlet Witch and Hope Summers, and that it is either going to be great or a disaster in the Marvel Universe. Based on what I am reading so far, for the readers, especially those of us who remain the backbone of comicdom, it is a major letdown. Scott Summers is a Sucker Punching Little B****! OK, as Marvel has been ripping us off for the past few months with a couple pages devoted to the buildup of this monstrosity, we know that the Phoenix force is coming for Earth, and namely, Hope Summers. They had a stupid mini-series where they tried to revive the most overhyped and pathetic mutant character ever, Cable, as some type of bad arse. Lame. 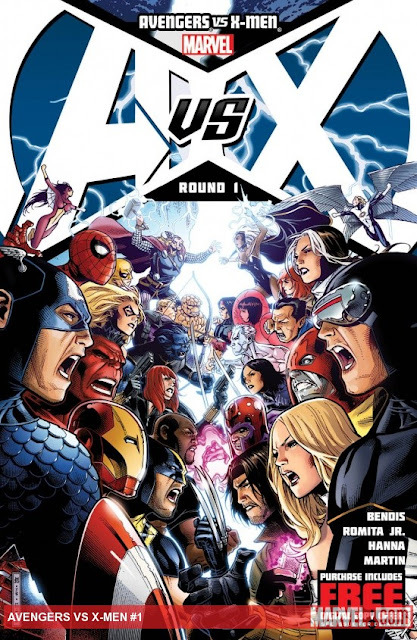 So now, we are going to have Avenger vs. Xman. Where will Wolverine end up? What about Beast? Storm? The Phoenix force is destroying planets on its way to Earth. A blast nearly takes out the Empire State Building. Turns out it is Nova, with a warning from space that Phoenix is coming. Now we see the war fog brewing. Meanwhile, in Utopia, Scott Summers aka Cyclops is engaging in borderline abuse “training” Hope Summers. He pushes and pushes, with only caring about his own agenda, not caring much about what she wants. Magneto is even slightly concerned by what he sees. Cyclops is no longer the idealistic leader he was. Now, he is a borderline sadist, driven by some quasi-religious devotion to the Phoenix. From what I see, all he is doing is pushing Hope further to darkness. Cap and the Avengers are called in to try to contain the Phoenix. Cap, always being the fair minded person, shows up at Utopia and asks Cyclops that Hope be given over to Avengers custody. Cyclops shows he is no better than Magneto or the worst of the Sub Mariner with his answers and actions. Let the war begin. Not much really. The worst of every character appears. Only Cap, Wolverine, and ironically magneto appear to be reasonable. Everyone else just seems to have their own agenda in mind. And, when the ultimate voice of calm is Wolverine, you know there is something wrong. However, we see what is going to happen. Cap and the Avengers are going to be painted as oppressors, and the mutants, even though they, under Cyclops, are the obvious aggressors and traitors to Professor X’s dream; will be seen as the heroes. Hope Summers, a spoiled sheltered, albeit abused by Cyclops, Brat, will be seen as a victim. Wolverine will probably switch sides. Yawn. And I wouldn’t be surprised if Jean Gray returns…..again….. If you thought Cyclops was a hero, forget it. He is no longer even an anti-hero. He is s self-righteous petty dictator who is a quasi-religious zealot. Cap and co. are too much in bed with the government. I hope Cap leaves the Obama Administration soon. After all, it is the President’s duty and the secretary of Defense to be in charge of security, not a super hero. Cap is better being the leader to the masked community he is. And Cyclops’s diatribe about how Cap never cared…..um hello, you one eyed jackass! Who put mutants on the Avengers? Cap! Duh! The writing is not befitting the characters. Looking at issue two, which goes back and forth in time, leaves me less impressed and only confirms: Cap is right. Cyclops is just a lovesick, deluded little tool who is only enabling the darkness within the Phoenix/Hope.